The most versatile braai for the most diverse nation. Kamado JAN is no ordinary braai. This is the ultimate all in one outdoor grill! Anything goes, from pizza to a 12 hour slow roast. Braai, Bake, Grill, Roast, Smoke and Sear all day long! We include everything you need in a convenient all in one starter kit! Nothing in life lasts forever except your Kamado JAN. Enjoy a lifetime warranty on the ceramic components for your peace of mind. 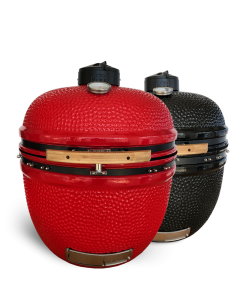 The Ceramic Dome retains heat and locks in the natural oils and moisture of food, whereas steel kettle braai’s radiates heat drawing the moisture out. 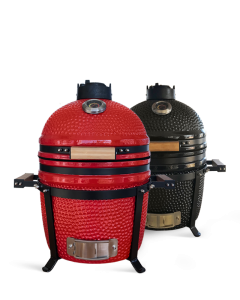 The Natural Lump Charcoal provides superior heat and true wood fired flavour. Chicken or Beef? Do it all at once! The Divide & Conquer system allows for multi-level cooking with different heat zones at the same time. Low to no maintenance, we love it!! No need to clean your Kamado JAN after every use, simply close your vents and walk away. The most economical braai out there! The unburnt charcoal is reusable. Simply relight the left over charcoal from the previous use, only top up if necessary. Handle the heat in a cool way. Accurately control and monitor your temperature with the built in vents and thermometer. 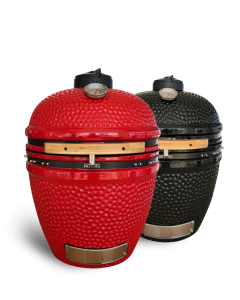 Our complete range of Kamado JAN accessories opens up endless cooking possibilities.